It is not very often that you have a friend who is bold enough to tell you that your breath or body stinks (exuding an offensive odour). A lot of times they do not want you to feel embarrassed and they'd rather endure the odour than tell you or even in a subtle way try to offer you solutions. You may wonder, if I smell that bad, how come I cannot perceive it. 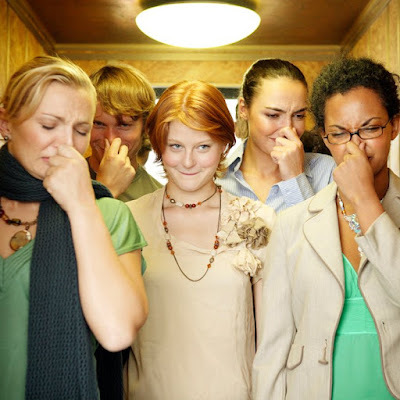 We tend to get used to our own smells so it’s hard for a person to tell if he or she has bad breath or body odour. Bad breath, or halitosis can be a major problem especially when you want to whisper a joke to your friend. In the majority of cases, the cause of bad breath, or halitosis, is the product of bacteria in the mouth. When you don’t brush or floss regularly, bacteria accumulate on the bits of food left in your mouth and between your teeth. The compounds released by these bacteria make your breathe smell. These bacteria produce waste products, and it’s these chemical compounds that contribute towards halitosis. The main offenders are volatile sulfur compounds, or VSCs; hydrogen sulfide has a smell of rotting eggs, methanethiol (also known as methyl mercaptan) has the odour of rotting cabbage, and dimethyl sulfide has similarly pleasant likeness to rotting cabbage, or garlic. At low levels, these compounds aren’t detected by the human nose, but it doesn’t take a great deal for them to become noticeable; 0.00047 parts per million is the threshold for the human nose being able to detect hydrogen sulfide, for instance. · Garlic breath is attributed to allyl methyl sulfide, a product of the breakdown of garlic, which unsurprisingly has an odour described as garlic-like. · Eating meat & fish can also lend your breath a formidable scent. The bacteria that produce VOCs thrive on proteins, and they can also produce other compounds, such as cadaverine and putrescine, associated with the smells of rotting corpses and rotting fish respectively. To sufficiently clean all the surfaces of your teeth, you should brush for at least 2 minutes at least twice a day. Remember to brush your tongue, too — bacteria love to hang out there. It’s equally important to floss because brushing alone won’t remove harmful plaque and food particles that become stuck between your teeth and gums. While we are at it, let’s share a word or two on care of your toothbrush. It is advised that you allow your toothbrush to dry out between uses. Toothbrushes can be breeding grounds for germs; fungus and bacteria, which can build up to significant levels after a while. After using your toothbrush, shake it vigorously under tap water and store it in an upright position so that it can air out. To prevent cold and flu viruses from being passed between brushes, try to keep your toothbrush from touching others when it is stored. A standard toothbrush holder with slots for several brushes to hang upright is a worthwhile investment in your family’s health. Most dentists agree you should change your toothbrush every three months. Studies show that after three months your toothbrush is much less effective at removing plaque from teeth and gums compared to new ones. The bristles also break down and are not as effective in getting to all those tricky corners around your teeth. It is also very important to change toothbrushes after you’ve had a cold, the flu, a mouth infection or a sore throat. That’s because germs can hide in toothbrush bristles and lead to reinfection. Do note that even if you haven’t been sick, fungus and bacteria can develop in the bristles of your toothbrush —another reason to change your toothbrush regularly. When you talk, you tend to bring out the odors from the back of your mouth (where bad breath originates), which simply breathing doesn’t do. If you brush and floss properly and visit your dentist for regular cleanings, but your bad breath persists, you may have a medical problem like sinusitis or gum disease. See your doctor or dentist if you suspect a problem and they can help you take care of it. Sulfur-containing organic compounds are again to blame for the variety of odours produced in the digestive system. The main sulfur-containing compound here is hydrogen sulfide, followed by methanethiol & dimethyl sulfide, all of which we’ve already met. You might ask which particularly complicated scientific method was used to determine their presence – as well as gas chromatography, a slightly more rudimentary method was utilised in one study. As part of the research, 16 subjects were fed 200g of pinto beans, then had their ‘samples’ collected via the use of a ‘rectal tube’. It gets better. An interesting observation of this study was the difference between the farts of men and women. Though the small sample size means it isn’t possible to draw definite conclusions, they noted that the women in the study emitted a significantly higher concentration of hydrogen sulfide, and the judges both ascribed to them a significantly worse odour. They also noted that men tended to generate ‘a greater volume of gas per passage’. Now we know. Body smells are caused by a number of factors working together, including chemicals in sweat e.g. pheromones, which are made by the body and sexually attract (or repel) other people, wastes excreted through the skin; the actions of bacteria that live on the skin and feed on dead skin cells and sweat and smells that may emanate from unwashed clothes. One of the ways to keep clean is to bath or shower every day using a mild soap and warm water. This will help tremendously. Wearing clean clothes, socks, and underwear each day can also help you to feel clean and prevent bad odours. If you sweat a lot, you might find that shirts, T-shirts, socks, and underwear made from cotton or other natural materials will help absorb sweat more effectively. Your underarms are home to an estimated one million bacteria per square centimetre; these convert your otherwise odourless sweat into a variety of mal-odorous molecules. Underarm odour actually introduces two organic compounds that don’t contain sulfur into the mix. 3-methyl-2-hexenoic acid is widely considered to be one of the main contributors to the human ‘sweaty’ aroma, which itself has an aroma delightfully described as ‘goat-like’. 3-hydroxy-3-methylhexanoic acid contributes a cumin-like scent, whilst 3-methyl-3-sulfanylhexan-1-ol (along with other sulfur-containing compounds) provides an onion note (it is in fact present in a 75:25 ratio of two enantiomers, the lesser of which has a fruitier aroma). If you’re concerned about the way your underarms smell, you can try using deodorants/antiperspirants. Again, sweat is a major player in foot odour – however, as with underarm odour, it’s due to the fact that it provides a beneficial environment for bacteria to grow, and it’s the compounds that these bacteria produce that cause the perceived odour. Methanethiol we’ve already come across at several points; two of the other main compounds contributing to ‘cheesy’ feet are propanoic acid & isovaleric acid. Propanoic acid is described as ‘pungent, sour and rancid’, whilst isovaleric acid attracts similar plaudits: ‘cheesy, rancid & fermented.’ The presence of isovaleric acid is actually the result of a bacteria also found in some strong cheeses.